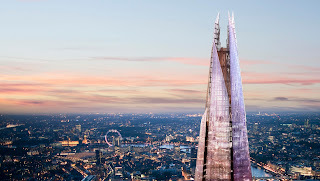 I fear I may be in the minority when I say that I'm a big fan of The Shard. I was surprised to discover that a lot of Londoners aren't as keen on the new addition to their landscape. But I think it's a unique and beautiful building, something that seems like it's been missing from the skyline of London. It seemed to pop up out of nowhere. I used to spend quite a lot of time around London Bridge, but since moving to Ireland I'm not there as much. It was last August when I left the train station and saw that a huge glass building had suddenly appeared. I liked it immediately. So I was eager to see what the view from the top had in store. I got a preview of the experience last week. It's not quite finished, but I got a fairly good idea as to what the set up will be. I went up via the office entrance, and if this is any indication of the main visitor lobby, expect good things. 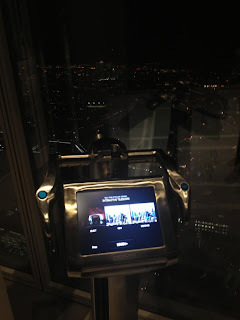 The lifts whizz you to to level 72, the highest habitable level of The Shard, at 244m (800ft) high. This, fact fans, is the highest vantage point from any building in western Europe. All of London is laid out before you - the Olympic stadium, Tower Bridge, Buckingham Palace... and on a clear day, you can even see the sea. I visited at night, which made for a beautiful sparkly vista, but you can probably make more of the city out during the day. If you're clever, you can time your visit to take in the last of the afternoon sun, the sunset and the start of the evening. And what of the days when you can't see a thing? This is London, after all. Well, this may surprise you, but those days are few and far between. 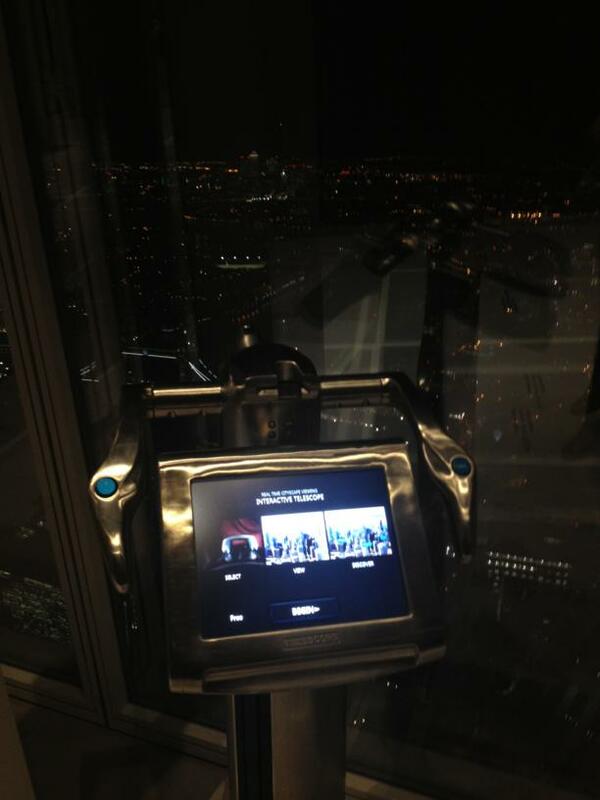 The people behind The View From The Shard worked closely with the Met Office, who said that there are only a few days a year that will be shrouded in fog. For the really nosey, there are 12 'Tell:scopes' dotted around the floor. These state of the art digital telescopes are being used in Europe for the first time, and are fully interactive. Whatever you point them at below, the screen will give you three options - night, day and live. You can zoom in, find out more about whatever sight you're pointing it at, and spy on all the people below. The View From The Shard will be opening on February 1st, but is only one element of the building. There will also be offices, apartments and a restaurant but, what I can't wait to see, is the Shangri La hotel. The real icing on the cake will be the infinity pool on level 52. All of this does, of course, come at a cost. Advance tickets cost £24.95 for adults and £18.95 for children, which is a little steep. As a point of comparison, it costs $25 (£15) to visit the observatory of the Empire State Building, and €14 (£11) to get to the top of the Eiffel Tower. So, it's steep. There's no escaping it. But if you want to take in the whole of London, while helicopters fly beneath you, then this is your only spot.